Jarrad teaches in Bentleigh studio. 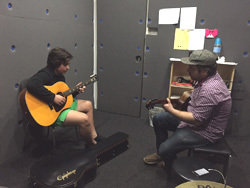 Jarrad teaches guitar, bass, mandolin, piano and drums. He has learned all these instruments from a young age and has performed and composed music on guitar, bass and mandolin for over 15 years and piano and drums for over 5 years . Jarrad is a live and studio session musician in Melbourne and plays in several bands. Jarrad is also a multi-genre composer who writes music in styles ranging from rock, reggae, blues, metal, prog, folk, hip hop, trance, electronica, classical and any combination of these. He is interested and influenced by all musical styles, particularly those that involve improvisation. 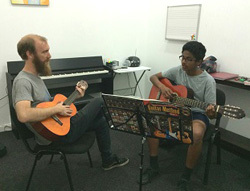 Jarrad’s aim is not only to teach the essential practical and theoretical aspects of an instrument but also to engage students in a manner that enables them to have fun with every aspect of learning music. Jarrad also aims to nurture expression and creativity in his students and he believes this is vital in not only the arts but in life. 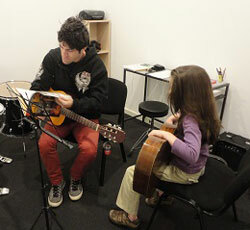 Henry teaches in Bentleigh studio. Henry Robinson is a multi-instrumental teacher. He attained a Bachelor of Music from JMC Academy. Henry is a very active musician in the Melbourne scene, and with over 8 years experience teaching drums, guitar and piano. Henry is catering to each individual’s needs through focus of theoretical and performance practices. Hayley teaches in Bentleigh studio. Hayley began playing drums in high school and has been performing for over ten years. During her VCE studies Hayley also became proficient on the guitar as a secondary instrument. Hayley is trained in both Classical and jazz music theory. After completing VCE music, Hayley continued further study in music performance. Obtaining her Cert III, Cert IV and Advanced Diploma of Music Performance at NMIT. 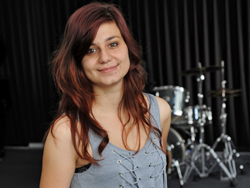 Hayley decided to further her education by completing her Bachelor of Arts - Applied Music Performance, majoring in drums at Boxhill Institute of TAFE. Hayley is a competent teacher of both drums and guitar, specialising in rock, jazz, latin and classical techniques. Hayley enjoys a challenge and she is always working to further develop her skills in all aspects of her music career. Andrew is an adaptive musician who can jump from style to style, instrument to instrument at the drop of a hat. He strongly believes every genre of music is worth exploring. From Classical to Electronic, Hiphop to Folk. Any style you want to learn, he can teach! 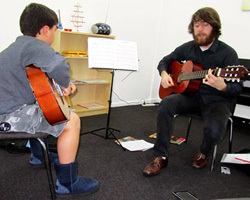 Andrew can offer advanced guitar lessons, as he has been playing for 14 years. As well as beginner - intermediate drum and piano lesson. 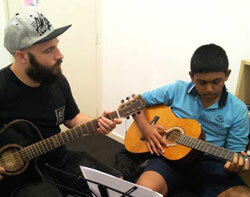 He is currently studying a Bachelor of Applied Music at Box Hill Institute. Andrew also specialises in modern music production, utilising digital audio workstations to create music. So if you’re interested in pursuing digital music and expressing your creativity, bring your a laptop or iPad to a lesson and we can create some music! Pat teaches in Bentleigh studio. Pat first started playing guitar at the age of 12. At the time he mostly taught himself by playing along with his favourite records. At the age of 15, he discovered the world of Jazz and soon realized he lacked the skills to be able to fully function in this music art form. In 1981 Pat started his jazz guitar studies with professional guitarist Mark Cally. After completing "A Modern Method Guitar" series of books Mark recommended Pat to continue his studies with Melbourne jazz guitar icon Bruce Clarke at the Bruce Clarke Guitar Workshop. Pat studied with Bruce for a year before having to move out of Melbourne for work. During the 1990s Pat travelled to New York City on numerous occasions in order to continue his studies and experience the NYC jazz scene first hand. During these visits Pat managed to study guitar with contemporary guitarist / educator Bruce Arnold amongst others. In 1996, Pat attended a jazz guitar master class workshop with guitar great, John Scofield. A highlight for Pat was that he managed to sit in with John Scofield’s trio during the final performances. A week later Pat also attended two other master class workshops with world-renowned jazz guitar icons Jim Hall and Pat Martino. From 2002 – 2008 Pat worked in the Cruise Ship industry internationally. He successfully completed contracts as a professional guitarist for Holland America Line, Princess Cruises and Cunard Cruise lines. During these contracts Pat perform nightly, functioning either within the on-board Show-band or playing solo guitar at the Atrium stage mid ship. Pat also holds a Master Certificate in Songwriting and a Professional Certificate in General Music Studies through the Berklee College of Music - Online School. 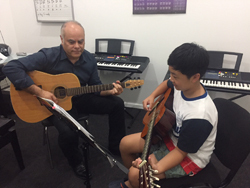 Through his experience as a professional guitarist and educator, Pat was able to gain recognition as a Registered Guitar Tutor at London College of Music - RGT@LCM. This means he is able to guide guitar students through the RGT@LCM system of Performance Diplomas. Click: RGT@LCM Exams to find out more. When learning guitar with Pat you can expect to follow a guitar method, which has been proven to deliver results. Past students have been kept motivated and challenged, as they progress through the study material. Pat believes: "as musicians, we work in the entertainment industry, so I always make it clear to young students that music is firstly about having fun. The more you learn, the more fun you’ll have". Pat has studied singing with Glenda Walsh, and Ken Tamplin. Glenda Walsh is a very experienced singer and educator. She was recommended by Australian pop idol - Kate Ceberano to work as a Vocal Coach on the Australian TV show The X Factor. Also Pat has studied piano with Los Angeles based Pianist / Educator Mark Harrison. Mark has a wealth of experience as a composer and educator. He has authored a number of piano method books and has taught at the renowned Grove School of Music. Pat is now also available to take on students in piano and singing in contemporary styles of music. 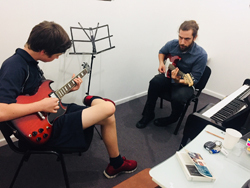 Nowadays, Melbourne based guitar teacher Pat Lajoie is busy composing and producing his original music as well as producing for other clients. He has been very successful getting his original music placed in music libraries in the USA. 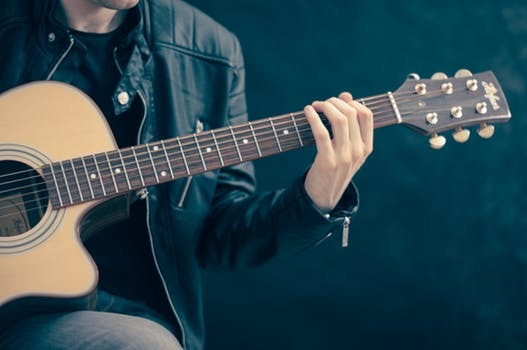 Learn to play guitar or develop further your guitar skills. Highly experienced teacher, lower rates and lots of fun.